After having the Super Bowl in our hometown of Minneapolis last year, we are thrilled to have the next big event coming back to our city, the NCAA Final Four. Like the Super Bowl, the Final Four is more than just hosting a game. It is a series of official and unnoficial events of all types surrounding the basketball games being played, for days and even weeks around the Final Four. With so many events surrounding the college games, there is a lot of competition to draw in guests and give them an amazing experience. One thing that can help provide that is renting an LED video wall to create an incredible visual experience that your guests won’t forget. We have a fleet of four mobile screens with several different screen sizes, including modular LED tiles from our partner company Fire Up Creative. 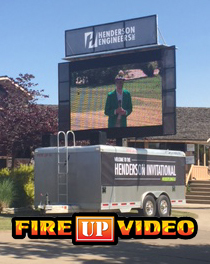 Our big screen TVs can be used in a variety of ways for your event, whether that is playing the games live, displaying a live camera, pre-recorded videos, slide shows, sponsor videos, event announcements and info, social media feeds, and more. Just let us know the details of your event and we will work with you to find the right solution. 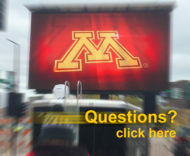 We provide Jumbtron video wall rentals for events in Minnesota, as well as surrounding states around the Midwest. For more information or to discuss the details of your event, please contact us at 612-759-1012 or baum3@earthlink.net.